When Follow Me was released I received lovely gifts from friends, a few of which were Pop Art/Andy Warhol themed, because of the influences in my book. The photo above shows a very thoughtful gift which was put together by my very creative friend, Rebecca – I love it so much and it is a brilliant memento to hang on my wall! Last year there was a bit of a Pop Art resurgence, with a Pop Art exhibition opening at the Tate Modern and the BBC recently devoting a whole week to the movement, broadcasting excellent documentaries such as, ‘How Pop Art Changed the World: Soup Cans and Superstars’ (by Alastair Sooke), and ‘A Day in the Life of Andy Warhol’ (by Stephen Smith). I was really interested to watch these as a lot of the observations and themes were ones I had written about and studied during my time at University, which then fed into aspects of my Young Adult novel, Follow Me. When studying Pop Culture as part of my undergraduate degree in Communication and Mass Media at Glasgow Caledonian University, I developed a fascination with Pop Art, and in particular one of the forefront artists, Andy Warhol. Warhol’s art was inspired by pop culture. He produced work which focused on celebrities and incorporated media headlines and everyday consumer products, such as Campbell Soup Cans and Coca-Cola bottles, into his art work. He used repetitive images, reflecting sameness and loss of originality. I continued to read about his art, and life, long after I graduated, all of which influenced the idea to feature an underground hangout in Follow Me called the Barn, modelled on Warhol’s infamous ‘Factory’. Warhol’s Factory studio was a magnet for celebrities and misfits – the artist’s workplace transformed into a social meeting place, attracting not only those in the art world, but film stars and other music icons. What always struck me was how perceptive Warhol was about the direction society was heading, in relation to our obsession with fame and ‘the surface image’. He championed the idea that ‘art is for everyone’ and should be accessible to the masses. He was credited with the infamous line, that, ‘In the future everyone will be famous for fifteen minutes.’ With the oversaturation of reality TV and the oversharing of our daily lives – through personal photos and video clips on social media channels – it appears that today everyone is indeed having their fifteen minutes of fame. Society’s obsession with image and fascination with celebrities, (a fascination which appears to deepen when they die young, at the height off their fame), sparked off other themes within my novel. Sooke stated something similar in his Soup Cans and Superstars documentary, saying Pop Art images are now ripped off and used to sell products. I also wore a pair of Campbell Soup Converse trainers to my first school event. The quote on the shoe box is from Warhol ~ Art is what you can get away with. (He used to customise his own Chuck Taylor trainers with silk screens). If you pop into the gift shop in the Gallery of Modern Art you’ll find Campbell Soup prints, donning the names of areas in Glasgow. I’ve had a wee bit of a #famousforfifteenminutes type of a weekend. 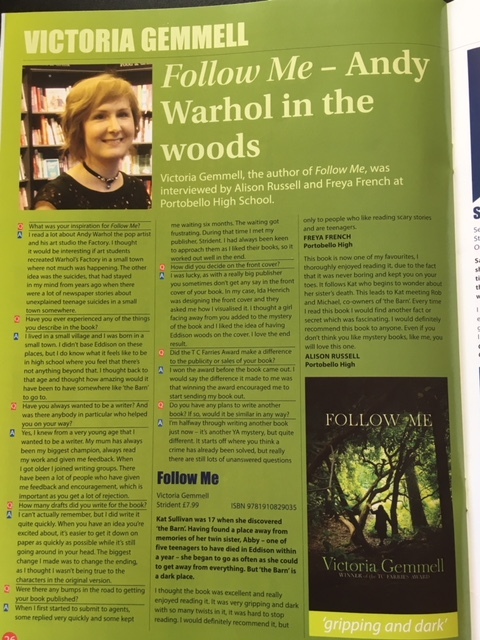 I was really excited to see Follow Me mentioned in the Books of The Year section in the Sunday Herald Life magazine, chosen by Scottish Crime Writer, Alex Gray as one of her favourite reads of 2015. My publisher, Strident, has the write-up on their website, which you can read here . I was also apparently featured on the cover of a Renfrewshire free paper on Friday, called Paisley People, but I have yet to get my hands on a copy of this to see the article! Yesterday I visited a group of thirty 4th years in St. Columba’s High School in Gourock. 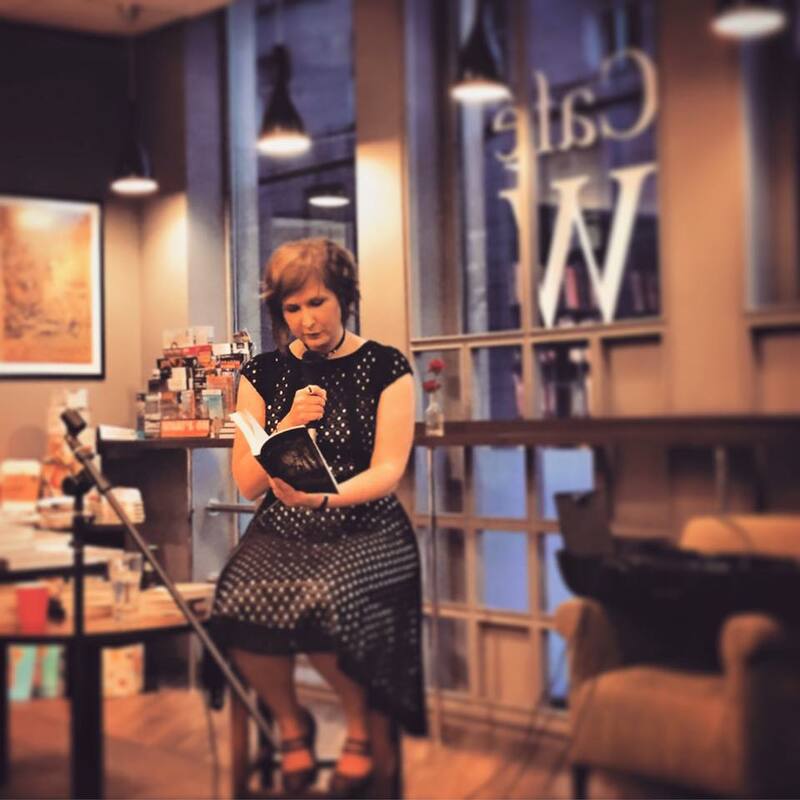 As it was the start of Book Week Scotland this was a perfect time to talk about books and writing. My journey there was eventful as my train got stopped due to an accident affecting the line, with no news on when they would be up and running again. I had to jump off and get a taxi down and just made it in time! I had a very interesting conversation with the taxi driver about books, writing, dyslexia and art, so that actually helped to calm my nerves. At the event I delivered a presentation about my writing journey, what’s involved in getting published and the inspiration behind ideas. I then asked the pupils to write a short flash fiction story, using some of the images of headlines I had posted up to inspire them. One of the pupils, James Patterson (what an appropriate writer name! ), let me read his very imaginative story – I’ve posted a photo of that below. A couple of the girls great stories too. It was brilliant to see everyone’s enthusiasm and I enjoyed talking to them all. If any of you are reading this, I hope you gave the 3 letter word story challenge a go! At the weekend I was in Winchester for the Society of Children’s Book Writers and Illustrators conference which was brilliant. It was great getting to meet creative people and talk about writing. 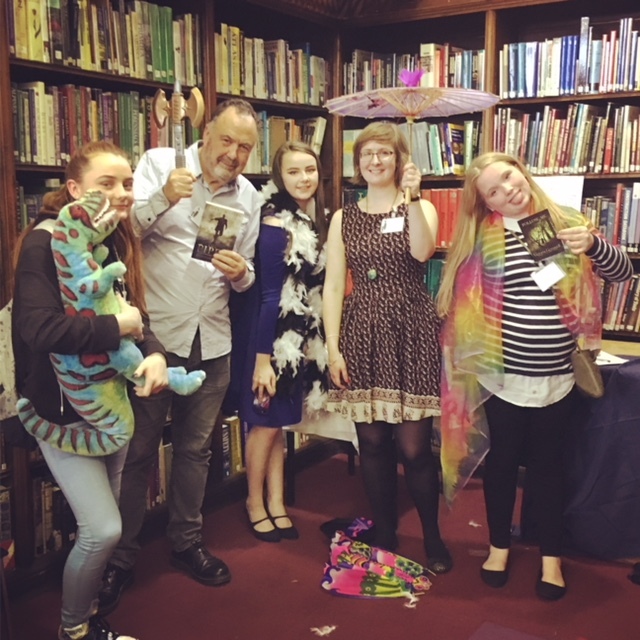 I also attended some really informative workshops, and it reminded me of the magic you can feel when you are involved in creating books. (and of course the hard work involved!). A highlight was taking part in the mass book launch party on the Saturday night in the Winchester Discovery Centre (the library). All of the participants book covers’ were emulated on the big cake, which looked and tasted amazing! There was a sea/pirate theme, so I decided to dress as an alternative pirate. This is a photo of me below in my pirate gear, on stage with my book. RRrrr. I loved Winchester too and hope to return one day soon! Last week I was at the Erskine Writers group annual dinner. As the group meet during the day it’s nice to catch up with everyone at the dinner. 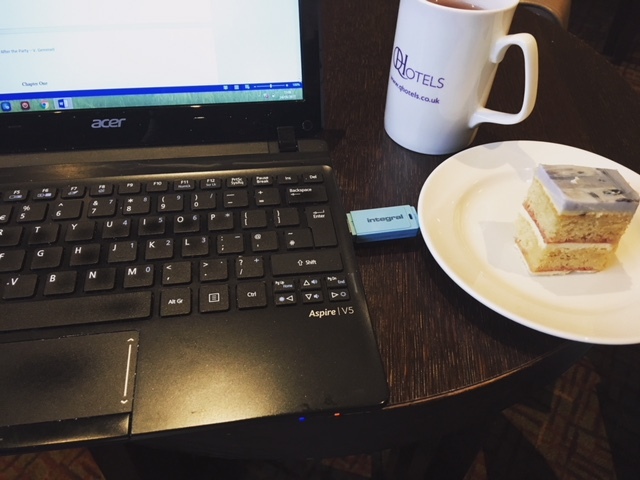 As a postal member of the group I get to stay in touch via email, and through updates on the blog, and also meet up with most of the group every year at the Scottish Association of Writers conference. I’ve been a member of the group since I was about seventeen. Erskine used to run evening sessions which allowed me to attend more regularly, and it was here I met some of my best friends. Over the years there have been so many interesting talks from a range of writers, and lots of inspiring workshops. Being part of a writing group gave me the confidence to start sharing my work with a wider audience, as well as teaching me more about structure and presentation for submissions. 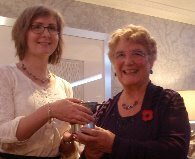 At this year’s dinner I received a lovely Quaich Trophy as I won first place in the Flash Fiction competition last year. The photo below is of myself and Elizabeth (on the right), the president, who handed out the awards. 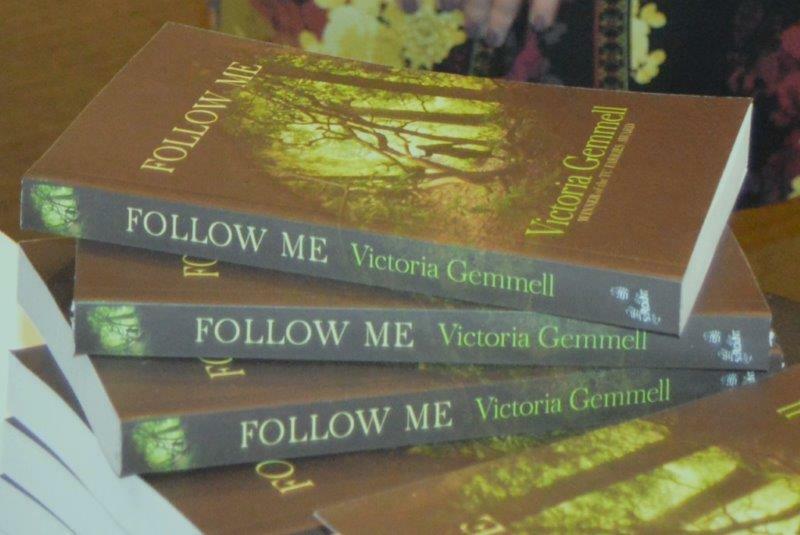 Follow Me ~ the books!! 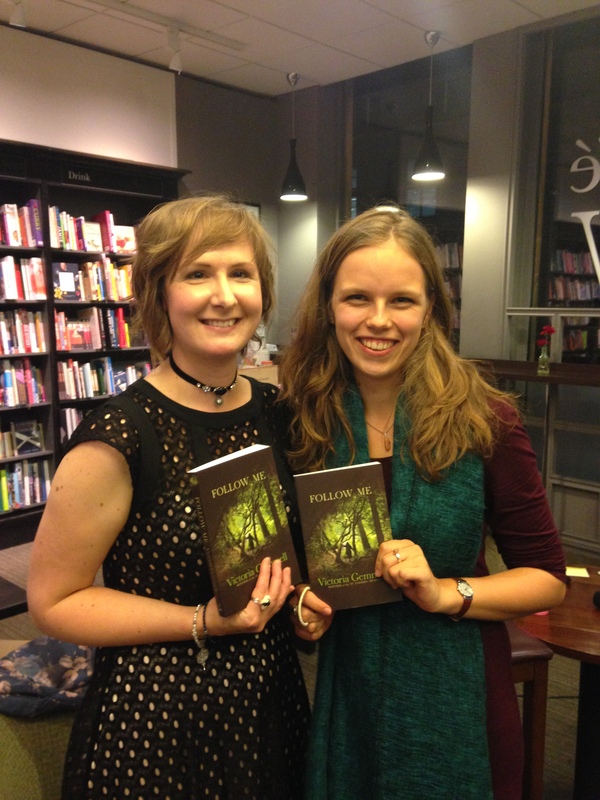 Last Friday evening was the launch night for my YA mystery, Follow Me, at Waterstones, Argyle Street in Glasgow, with my publisher Strident Publishing Ltd. What a night! 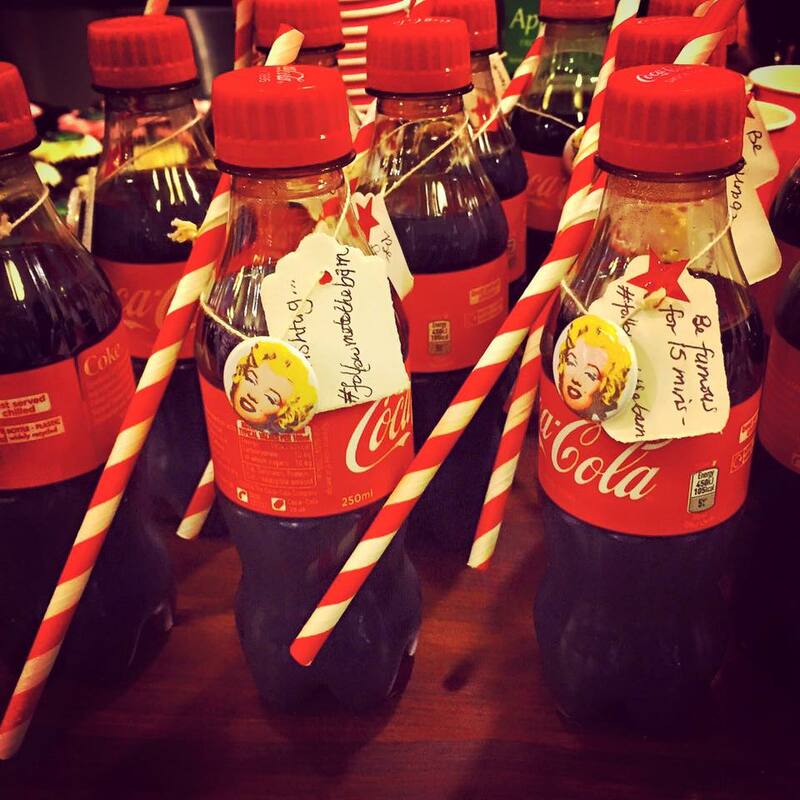 I really couldn’t have asked for a better launch – I took along my mini coca-cola bottles, with Marilyn Monroe badges, encouraging everyone to be ‘famous for fifteen minutes’ by joining in posting about the launch on social media, with the hashtag #followmetothebarn (I had lots of fun looking through the tweets the next day). 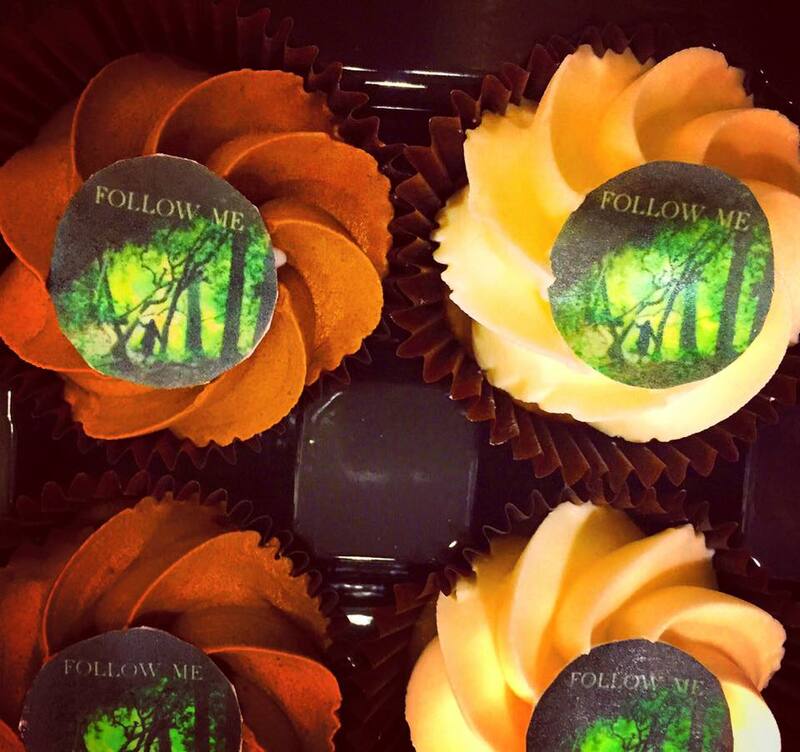 I also had my cupcakes with edible book cover toppers from the brilliant eatmyface.co.uk. My publisher, Keith, at Strident, was kind enough to supply wine and other soft drinks and my parents also brought along other savory nibbles. My publisher, Keith, did a Q&A with me and I read out short extracts from my novel in-between. He knows Follow Me nearly as well as I do now, so his questions were very intuitive and it made it feel like a friendly conversation. I was overwhelmed by the amount of support from friends and family and it was brilliant looking out into the audience at such an encouraging and happy crowd! I was pleasantly surprised that I didn’t feel nervous at all, which kept me calm when reading, and meant I enjoyed every minute of the night. I had my first taster of signing books at the end, and it felt surreal, but amazing, to be sitting in Waterstones surrounded by my own books, with people wanting to buy a signed copy! Afterwards I went for drinks to Drury Bar and Kitchen and they played a perfect selection of rock and alternative old-school tunes. It was lovely to be able to share such a special night with so many friends, some of whom I hadn’t seen for years. Even my old Primary Head Teacher turned up, which really made my night!! She was always so encouraging of my reading and writing in my last couple of years at primary school. I’ve put up slideshow of photos on the right hand side bar of my homepage – see if you can spot yourself! Big thanks to Derek Mooney who took loads of photos on the night and to Lorna McLaren, Peter Morrison and my Mum, Rosemary, and other friends who posted photos on social media. Thanks again to everyone who came along and made it such a brilliant night. It’s one I’m never going to forget.